In genetics, a promoter is a region of DNA that initiates transcription of a particular gene. Promoters are located near the transcription start sites of genes, on the same strand and upstream on the DNA (towards the 5' region of the sense strand). Promoters can be about 100–1000 base pairs long. For transcription to take place, the enzyme that synthesizes RNA, known as RNA polymerase, must attach to the DNA near a gene. Promoters contain specific DNA sequences such as response elements that provide a secure initial binding site for RNA polymerase and for proteins called transcription factors that recruit RNA polymerase. These transcription factors have specific activator or repressor sequences of corresponding nucleotides that attach to specific promoters and regulate gene expression. The promoter is recognized by RNA polymerase and an associated sigma factor, which in turn are often brought to the promoter DNA by an activator protein's binding to its own DNA binding site nearby. The process is more complicated, and at least seven different factors are necessary for the binding of an RNA polymerase II to the promoter. Promoters represent critical elements that can work in concert with other regulatory regions (enhancers, silencers, boundary elements/insulators) to direct the level of transcription of a given gene. As promoters are typically immediately adjacent to the gene in question, positions in the promoter are designated relative to the transcriptional start site, where transcription of DNA begins for a particular gene (i.e., positions upstream are negative numbers counting back from -1, for example -100 is a position 100 base pairs upstream). In the cell nucleus, it seems that promoters are distributed preferentially at the edge of the chromosomal territories, likely for the co-expression of genes on different chromosomes. Furthermore, in humans, promoters show certain structural features characteristic for each chromosome. In bacteria, the promoter contains two short sequence elements approximately -10 and -35 nucleotides upstream from the transcription start site. The sequence at -10 (the -10 element) has the consensus sequence TATAAT. The sequence at -35 (the -35 element) has the consensus sequence TTGACA. The above consensus sequences, while conserved on average, are not found intact in most promoters. On average, only 3 to 4 of the 6 base pairs in each consensus sequence are found in any given promoter. Few natural promoters have been identified to date that possess intact consensus sequences at both the -10 and -35; artificial promoters with complete conservation of the -10 and -35 elements have been found to transcribe at lower frequencies than those with a few mismatches with the consensus. The optimal spacing between the -35 and -10 sequences is 17 bp. Some promoters contain one or more upstream promoter element (UP element) subsites (consensus sequence 5'-AAAAAARNR-3' when centered in the -42 region; consensus sequence 5'-AWWWWWTTTTT-3' when centered in the -52 region; W = A or T; R = A or G; N = any base). It should be noted that the above promoter sequences are recognized only by RNA polymerase holoenzyme containing sigma-70. RNA polymerase holoenzymes containing other sigma factors recognize different core promoter sequences. Eukaryotic promoters are diverse and can be difficult to characterize, however, recent studies show that they are divided in more than 10 classes. Ten classes of eukaryotic promoters and their representative DNA Patterns. The representative eukaryotic promoter classes are shown in the following sections: (A) AT-based class, (B) CG-based class, (C) ATCG-compact class, (D) ATCG-balanced class, (E) ATCG-middle class, (F) ATCG-less class, (G) AT-less class, (H) CG-spike class, (I) CG-less class and (J) ATspike class. Gene promoters are typically located upstream of the gene and can have regulatory elements several kilobases away from the transcriptional start site (enhancers). In eukaryotes, the transcriptional complex can cause the DNA to bend back on itself, which allows for placement of regulatory sequences far from the actual site of transcription. Eukaryotic RNA-polymerase-II-dependent promoters can contain a TATA element (consensus sequence TATAAA), which is recognized by the general transcription factor TATA-binding protein (TBP); and a B recognition element (BRE), which is recognized by the general transcription factor TFIIB. The TATA element and BRE typically are located close to the transcriptional start site (typically within 30 to 40 base pairs). Eukaryotic promoter regulatory sequences typically bind proteins called transcription factors that are involved in the formation of the transcriptional complex. An example is the E-box (sequence CACGTG), which binds transcription factors in the basic helix-loop-helix (bHLH) family (e.g. BMAL1-Clock, cMyc). Some promoters that are targeted by multiple transcription factors might achieve a hyperactive state, leading to increased transcriptional activity. Bidirectional promoters are short (<1 kbp) intergenic regions of DNA between the 5' ends of the genes in a bidirectional gene pair. A “bidirectional gene pair” refers to two adjacent genes coded on opposite strands, with their 5' ends oriented toward one another. The two genes are often functionally related, and modification of their shared promoter region allows them to be co-regulated and thus co-expressed. Bidirectional promoters are a common feature of mammalian genomes. About 11% of human genes are bidirectionally paired. Bidirectionally paired genes in the Gene Ontology database shared at least one database-assigned functional category with their partners 47% of the time. Microarray analysis has shown bidirectionally paired genes to be co-expressed to a higher degree than random genes or neighboring unidirectional genes. Although co-expression does not necessarily indicate co-regulation, methylation of bidirectional promoter regions has been shown to downregulate both genes, and demethylation to upregulate both genes. There are exceptions to this, however. In some cases (about 11%), only one gene of a bidirectional pair is expressed. In these cases, the promoter is implicated in suppression of the non-expressed gene. The mechanism behind this could be competition for the same polymerases, or chromatin modification. Divergent transcription could shift nucleosomes to upregulate transcription of one gene, or remove bound transcription factors to downregulate transcription of one gene. Some functional classes of genes are more likely to be bidirectionally paired than others. Genes implicated in DNA repair are five times more likely to be regulated by bidirectional promoters than by unidirectional promoters. Chaperone proteins are three times more likely, and mitochondrial genes are more than twice as likely. Many basic housekeeping and cellular metabolic genes are regulated by bidirectional promoters. The overrepresentation of bidirectionally paired DNA repair genes associates these promoters with cancer. Forty-five percent of human somatic oncogenes seem to be regulated by bidirectional promoters – significantly more than non-cancer causing genes. Hypermethylation of the promoters between gene pairs WNT9A/CD558500, CTDSPL/BC040563, and KCNK15/BF195580 has been associated with tumors. Certain sequence characteristics have been observed in bidirectional promoters, including a lack of TATA boxes, an abundance of CpG islands, and a symmetry around the midpoint of dominant Cs and As on one side and Gs and Ts on the other. CCAAT boxes are common, as they are in many promoters that lack TATA boxes. In addition, the motifs NRF-1, GABPA, YY1, and ACTACAnnTCCC are represented in bidirectional promoters at significantly higher rates than in unidirectional promoters. The absence of TATA boxes in bidirectional promotors suggests that TATA boxes play a role in determining the directionality of promoters, but counterexamples of bidirectional promoters do possess TATA boxes and unidirectional promoters without them indicates that they cannot be the only factor. Although the term "bidirectional promoter" refers specifically to promoter regions of mRNA-encoding genes, luciferase assays have shown that over half of human genes do not have a strong directional bias. Research suggests that non-coding RNAs are frequently associated with the promoter regions of mRNA-encoding genes. 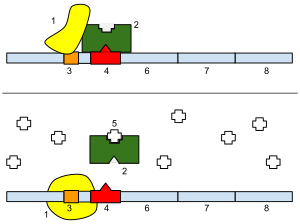 It has been hypothesized that the recruitment and initiation of RNA polymerase II usually begins bidirectionally, but divergent transcription is halted at a checkpoint later during elongation. Possible mechanisms behind this regulation include sequences in the promoter region, chromatin modification, and the spatial orientation of the DNA. A subgenomic promoter is a promoter added to a virus for a specific heterologous gene, resulting in the formation of mRNA for that gene alone. A wide variety of algorithms have been developed to facilitate detection of promoters in genomic sequence, and promoter prediction is a common element of many gene prediction methods. A promoter region is located before the -35 and -10 Consensus sequences. The closer the promoter region is to the consensus sequences the more often transcription of that gene will take place. There is not a set pattern for promoter regions as there are for consensus sequences. 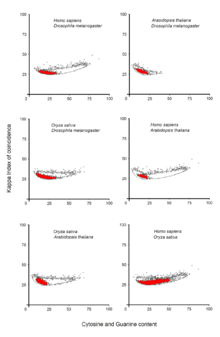 Superposition between promoter distributions from Homo sapiens, Drosophila melanogaster, Oryza sativa and Arabidopsis thaliana. Red color areas represent conserved promoter sequences. Gene promoters have been responsible for the integration of different mutations favorable for the environmental conditions. Recent studies based on DNA patterns show that gene promoters are directly subjected to an immediate selection pressure. A superposition of eukaryotic gene promoters from four different species shows that promoters of genes reflect the selection pressure of a species and less the phylogenetic relations between distant species. A major question in evolutionary biology is how important tinkering with promoter sequences is to evolutionary change, for example, the changes that have occurred in the human lineage after separating from other primates. Some evolutionary biologists, for example Allan Wilson, have proposed that evolution in promoter or regulatory regions may be more important than changes in coding sequences over such time frames. A key reason for the importance of promoters is the potential to incorporate endocrine and environmental signals into changes in gene expression: A great variety of changes in the extracellular or intracellular environment may have impacts on gene expression, depending on the exact configuration of a given promoter; the combination and arrangement of specific DNA sequences that constitute the promoter defines the exact groups of proteins that can be bound to the promoter, at a given timepoint. Once the cell receives a physiological, pathological, or pharmacological stimulus, a number of cellular proteins are modified biochemically by signal cascades. By changes in structure, specific proteins acquire the capability to enter the nucleus of the cell and bind to promoter DNA, or to other proteins that themselves are already bound to a given promoter. The multi-protein complexes that are formed have the potential to change levels of gene expression. As a result, the gene product may increase or decrease inside the cell. Other recent studies suggest that promoters of genes may be the primary cause of diabetes. Promoters of genes associated with diabetes by Genome-wide association studies (GWAS) show specific DNA patterns for each phenotype. This observation indicates that the promoters of these genes use specific transcription factors for each diabetes phenotype. 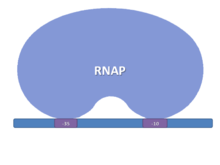 RNA Polymerase sigma 70 binding: The picture shows the region -35 and -10 of the promoter, which are the main regions of interactions with the sigma factor. Distribution of gene promoters associated with type 1 diabetes (T1D), Intermediary Diabetes Mellitus (IDM) and type 2 diabetes (T2D). T1D promoters (blue dots), T2D promoters (red dots) and promoters from genes associated with the “intermediary” phenotype (green dots). The initiation of the transcription is a multistep sequential process that involves several mechanisms: promoter location, initial reversible binding of RNA polymerase, conformational changes in RNA polymerase, conformational changes in DNA, binding of nucleoside triphosphate (NTP) to the functional RNA polymerase-promoter complex, and nonproductive and productive initiation of RNA synthesis. The promoter binding process is crucial in the understanding of the process of gene expression. Although RNA polymerase holoenzyme shows high affinity to non-specific sites of the DNA, this characteristic does not allow us to clarify the process of promoter location. This process of promoter location has been attributed to the structure of the holoenzyme to DNA and sigma 4 to DNA complexes. Although OMIM is a major resource for gathering information on the relationship between mutations and natural variation in gene sequence and susceptibility to hundreds of diseases, a sophisticated search strategy is required to extract diseases associated with defects in transcriptional control where the promoter is believed to have direct involvement. This is a list of diseases where evidence suggests some promoter malfunction, through either direct mutation of a promoter sequence or mutation in a transcription factor or transcriptional co-activator. Most diseases are heterogeneous in etiology, meaning that one "disease" is often many different diseases at the molecular level, though symptoms exhibited and response to treatment may be identical. How diseases of different molecular origin respond to treatments is partially addressed in the discipline of pharmacogenomics. Not listed here are the many kinds of cancers involving aberrant transcriptional regulation owing to creation of chimeric genes through pathological chromosomal translocation. Importantly, intervention in the number or structure of promoter-bound proteins is one key to treating a disease without affecting expression of unrelated genes sharing elements with the target gene. Genes where change is not desirable are capable of influencing the potential of a cell to become cancerous and form a tumor. In humans, about 70% of promoters located near the transcription start site of a gene (proximal promoters) contain a CpG island. CpG islands are generally 200 to 2000 base pairs long, have a C:G base pair content >50%, and have regions of DNA where a cytosine nucleotide is followed by a guanine nucleotide and this occurs frequently in the linear sequence of bases along its 5' → 3' direction. Distal promoters also frequently contain CpG islands, such as the promoter of the DNA repair gene ERCC1, where the CpG island-containing promoter is located about 5,400 nucleotides upstream of the coding region of the ERCC1 gene. CpG islands also occur frequently in promoters for functional noncoding RNAs such as microRNAs. In humans, DNA methylation occurs at the 5' position of the pyrimidine ring of the cytosine residues within CpG sites to form 5-methylcytosines. The presence of multiple methylated CpG sites in CpG islands of promoters causes stable silencing of genes. Silencing of a gene may be initiated by other mechanisms, but this is often followed by methylation of CpG sites in the promoter CpG island to cause the stable silencing of the gene. Generally, in progression to cancer, hundreds of genes are silenced or activated. Although silencing of some genes in cancers occurs by mutation, a large proportion of carcinogenic gene silencing is a result of altered DNA methylation (see DNA methylation in cancer). DNA methylation causing silencing in cancer typically occurs at multiple CpG sites in the CpG islands that are present in the promoters of protein coding genes. Altered expressions of microRNAs also silence or activate many genes in progression to cancer (see microRNAs in cancer). Altered microRNA expression occurs through hyper/hypo-methylation of CpG sites in CpG islands in promoters controlling transcription of the microRNAs. Silencing of DNA repair genes through methylation of CpG islands in their promoters appears to be especially important in progression to cancer (see methylation of DNA repair genes in cancer). The usage of the term canonical sequence to refer to a promoter is often problematic, and can lead to misunderstandings about promoter sequences. Canonical implies perfect, in some sense. In the case of a transcription factor binding site, there may be a single sequence that binds the protein most strongly under specified cellular conditions. This might be called canonical. However, natural selection may favor less energetic binding as a way of regulating transcriptional output. In this case, we may call the most common sequence in a population the wild-type sequence. It may not even be the most advantageous sequence to have under prevailing conditions. Recent evidence also indicates that several genes (including the proto-oncogene c-myc) have G-quadruplex motifs as potential regulatory signals. Some cases of many genetic diseases are associated with variations in promoters or transcription factors. Some promoters are called constitutive as they are active in all circumstances in the cell, while others are regulated, becoming active in the cell only in response to specific stimuli. When referring to a promoter some authors actually mean promoter + operator; i.e., the lac promoter is IPTG inducible, meaning that besides the lac promoter, the lac operator is also present. If the lac operator were not present the IPTG would not have an inducible effect. Another example is the Tac-Promoter system (Ptac). Notice how tac is written as a tac promoter, while in fact tac is actually both a promoter and an operator. ↑ "Analysis of Biological Networks: Transcriptional Networks – Promoter Sequence Analysis" (PDF). Tel Aviv University. Retrieved 30 December 2012. 1 2 3 Gagniuc, P; Ionescu-Tirgoviste C (2013). "Gene promoters show chromosome-specificity and reveal chromosome territories in humans.". BMC Genomics. 14 (278): 278. doi:10.1186/1471-2164-14-278. PMID 23617842. 1 2 Smale, T.; Kadonaga, T. (2003). "The RNA polymerase II core promoter". Annual Review of Biochemistry. 72: 449–479. doi:10.1146/annurev.biochem.72.121801.161520. ISSN 0066-4154. PMID 12651739. ↑ Ross, W.; Gosink, K. K.; Salomon, J.; Igarashi, K.; Zou, C.; Ishihama, A.; Severinov, K.; Gourse, R. L. (1993). "A third recognition element in bacterial promoters: DNA binding by the alpha subunit of RNA polymerase". Science. 262 (5138): 1407–1413. doi:10.1126/science.8248780. PMID 8248780. ↑ Estrem, S. T.; Ross, W.; Gaal, T.; Chen, Z. W.; Niu, W.; Ebright, R. H.; Gourse, R. L. (1999). "Bacterial promoter architecture: Subsite structure of UP elements and interactions with the carboxy-terminal domain of the RNA polymerase alpha subunit". Genes & Development. 13 (16): 2134–2147. doi:10.1101/gad.13.16.2134. PMC 316962 . PMID 10465790. 1 2 3 4 Gagniuc, P; Ionescu-Tirgoviste, C (Sep 28, 2012). "Eukaryotic genomes may exhibit up to 10 generic classes of gene promoters." (PDF). BMC Genomics. 13 (1): 512. doi:10.1186/1471-2164-13-512. PMC 3549790 . PMID 23020586. Retrieved 7 January 2013. ↑ Gershenzon NI, Ioshikhes IP; Ioshikhes (2005). "Synergy of human Pol II core promoter elements revealed by statistical sequence analysis". Bioinformatics. 21 (8): 1295–300. doi:10.1093/bioinformatics/bti172. PMID 15572469. ↑ Lagrange T, Kapanidis, Tang, Reinberg, Ebright (1998). "New core promoter element in RNA polymerase II-dependent transcription: sequence-specific DNA binding by transcription factor IIB". Genes & Development. 12 (1): 34–44. doi:10.1101/gad.12.1.34. PMC 316406 . PMID 9420329. ↑ Levine, M.; Tjian, R. (July 2003). "Transcription regulation and animal diversity". Nature. 424 (6945): 147–151. doi:10.1038/nature01763. ISSN 0028-0836. PMID 12853946. ↑ Liefke, R; Windhof-Jaidhauser, IM; Gaedcke, J; Salinas-Riester, G; Wu, F; Ghadimi, M; Dango, S (June 2015). "The oxidative demethylase ALKBH3 marks hyperactive gene promoters in human cancer cells.". Genome Med. 7 (1): 66. doi:10.1186/s13073-015-0180-0. PMC 4517488 . PMID 26221185. 1 2 3 4 5 Trinklein, N. D.; Aldred, S. F.; Hartman, S. J.; Schroeder, D. I.; Otillar, R. P.; Myers, R. M. (2003). "An Abundance of Bidirectional Promoters in the Human Genome". Genome Research. 14 (1): 62–6. doi:10.1101/gr.1982804. PMC 314279 . PMID 14707170. ↑ Yang, Mary Q.; Koehly, Laura M.; Elnitski, Laura L. (2007). "Comprehensive Annotation of Bidirectional Promoters Identifies Co-Regulation among Breast and Ovarian Cancer Genes". PLoS Computational Biology. 3 (4): e72. Bibcode:2007PLSCB...3...72Y. doi:10.1371/journal.pcbi.0030072. PMC 1853124 . PMID 17447839. ↑ Adachi, Noritaka; Lieber, Michael R. (2002). "Bidirectional Gene Organization". Cell. 109 (7): 807–9. doi:10.1016/S0092-8674(02)00758-4. PMID 12110178. ↑ Koyanagi, Kanako O.; Hagiwara, Masato; Itoh, Takeshi; Gojobori, Takashi; Imanishi, Tadashi (2005). "Comparative genomics of bidirectional gene pairs and its implications for the evolution of a transcriptional regulation system". Gene. 353 (2): 169–76. doi:10.1016/j.gene.2005.04.027. PMID 15944140. ↑ Liu, Bingchuan; Chen, Jiajia; Shen, Bairong (2011). "Genome-wide analysis of the transcription factor binding preference of human bi-directional promoters and functional annotation of related gene pairs". BMC Systems Biology. 5: S2. doi:10.1186/1752-0509-5-S1-S2. 1 2 Shu, J.; Jelinek, J; Chang, H; Shen, L; Qin, T; Chung, W; Oki, Y; Issa, J. P. (2006). "Silencing of Bidirectional Promoters by DNA Methylation in Tumorigenesis". Cancer Research. 66 (10): 5077–84. doi:10.1158/0008-5472.CAN-05-2629. PMID 16707430. 1 2 Wei, Wu; Pelechano, Vicent; Järvelin, Aino I.; Steinmetz, Lars M. (2011). "Functional consequences of bidirectional promoters". Trends in Genetics. 27 (7): 267–76. doi:10.1016/j.tig.2011.04.002. PMID 21601935. ↑ Lin, J. M.; Collins, P. J.; Trinklein, N. D.; Fu, Y.; Xi, H.; Myers, R. M.; Weng, Z. (2007). "Transcription factor binding and modified histones in human bidirectional promoters". Genome Research. 17 (6): 818–27. doi:10.1101/gr.5623407. PMID 17568000. ↑ Gagniuc, Paul; Ionescu-Tirgoviste, Constantin (2012-09-28). "Eukaryotic genomes may exhibit up to 10 generic classes of gene promoters". BMC Genomics. 13 (1): 512. doi:10.1186/1471-2164-13-512. ISSN 1471-2164. PMC 3549790 . PMID 23020586. 1 2 Vlahopoulos S, Zoumpourlis VC; Zoumpourlis (2004). "JNK: a key modulator of intracellular signaling". Biochemistry (Mosc). 69 (8): 844–54. doi:10.1023/B:BIRY.0000040215.02460.45. PMID 15377263. ↑ Veitia RA, Nijhout HF; Nijhout (2006). "The robustness of the transcriptional response to alterations in morphogenetic gradients". BioEssays. 28 (3): 282–9. doi:10.1002/bies.20377. PMID 16479586. ↑ Tomilin NV (2008). "Regulation of mammalian gene expression by retroelements and non-coding tandem repeats". BioEssays. 30 (4): 338–48. doi:10.1002/bies.20741. PMID 18348251. ↑ Celniker SE, Drewell RA; Drewell (2007). "Chromatin looping mediates boundary element promoter interactions". BioEssays. 29 (1): 7–10. doi:10.1002/bies.20520. PMID 17187351. ↑ Smith CL (2008). "A shifting paradigm: histone deacetylases and transcriptional activation". BioEssays. 30 (1): 15–24. doi:10.1002/bies.20687. PMID 18081007. 1 2 3 4 Ionescu-Tîrgovişte, Constantin; Gagniuc, Paul Aurelian; Guja, Cristian. "Structural Properties of Gene Promoters Highlight More than Two Phenotypes of Diabetes". PLOS ONE. 10 (9): e0137950. doi:10.1371/journal.pone.0137950. PMC 4574929 . PMID 26379145. ↑ DeHaseth, P.L. ; Zupancic,, M.; Recor, T.M. (1998). "RNA Polymerase-Promoter Interactions: the Comings and Goings of RNA Polymerase". Journal of Bacteriology. 180: 3019–3025. PMC 107799 . PMID 9620948. ↑ Singer, P.; Wu, C.W. (1987). "Promoter Search by Escherichia coli RNA Polymerase on a Circular DNA Template". The Journal of Biological Chemistry. 262: 14178–14189. ↑ Borukhov, S.; Nudler, E. (2003). "RNA polymerase holoenzyme: structure, function and biological implications". Current Opinion in Microbiology. 6: 93–100. doi:10.1016/s1369-5274(03)00036-5. ↑ Deaton AM, Bird A (2011). "CpG islands and the regulation of transcription". Genes Dev. 25 (10): 1010–22. doi:10.1101/gad.2037511. PMC 3093116 . PMID 21576262. ↑ Chen HY, Shao CJ, Chen FR, Kwan AL, Chen ZP (2010). "Role of ERCC1 promoter hypermethylation in drug resistance to cisplatin in human gliomas". Int. J. Cancer. 126 (8): 1944–54. doi:10.1002/ijc.24772. PMID 19626585. 1 2 Bird A (2002). "DNA methylation patterns and epigenetic memory". Genes Dev. 16 (1): 6–21. doi:10.1101/gad.947102. PMID 11782440. ↑ Hobbs, K.; Negri, J.; Klinnert, M.; Rosenwasser, L. J.; Borish, L. (1998). "Interleukin-10 and Transforming Growth Factor- β Promoter Polymorphisms in Allergies and Asthma". American Journal of Respiratory and Critical Care Medicine. 158 (6): 1958–1962. doi:10.1164/ajrccm.158.6.9804011. PMID 9847292. ↑ Burchard, E. G.; Silverman, E. K.; Rosenwasser, L. J.; Borish, L.; Yandava, C.; Pillari, A.; Weiss, S. T.; Hasday, J.; Lilly, C. M.; Ford, J. G.; Drazen, J. M. (1999). "Association Between a Sequence Variant in the IL-4 Gene Promoter and FEV1in Asthma". American Journal of Respiratory and Critical Care Medicine. 160 (3): 919–922. doi:10.1164/ajrccm.160.3.9812024. PMID 10471619. ↑ Kulozik, A. B. K.; Bellan-Koch, A.; Bail, S.; Kohne, E.; Kleihauer, E. (May 1991). "Thalassemia intermedia: moderate reduction of beta globin gene transcriptional activity by a novel mutation of the proximal CACCC promoter element". Blood. 77 (9): 2054–2058. ISSN 0006-4971. PMID 2018842. ↑ Petrij, F.; Giles, H.; Dauwerse, G.; Saris, J.; Hennekam, C.; Masuno, M.; Tommerup, N.; Van Ommen, J.; Goodman, H.; Peters, D. J.; Breuning, M. H. (July 1995). "Rubinstein-Taybi syndrome caused by mutations in the transcriptional co-activator CBP". Nature. 376 (6538): 348–351. Bibcode:1995Natur.376..348P. doi:10.1038/376348a0. ISSN 0028-0836. PMID 7630403. Wikimedia Commons has media related to Genetic promoter regions. mybioinfo.info – A search engine that cuts out promoter region sequence of your gene of interest. SwitchDB – An online database used to analyze promoters and transcription start sites (TSSs) throughout the human genome. Pleiades Promoter Project – a research project with an aim to generate 160 fully characterized, human DNA promoters of less than 4 kb (MiniPromoters) to drive gene expression in defined brain regions of therapeutic interests.